When most people start collecting little rubber and plastic figures, part of their reasoning for buying tiny toys often stems from the fact that these collections don’t take up a lot of space. You can fit hundreds of tiny figures in a shoe box if you want to, and they don’t take up a lot of shelf space if you choose to display them (and why wouldn’t you!). Beyond their ability to occupy very little space, most little figure toy lines have dozens if not hundreds of designs to collect, as well as tons of color variations. They also tend to come in all sorts of wacky and wonderful character designs, which make little rubber figure collecting very popular with both kids and adults. 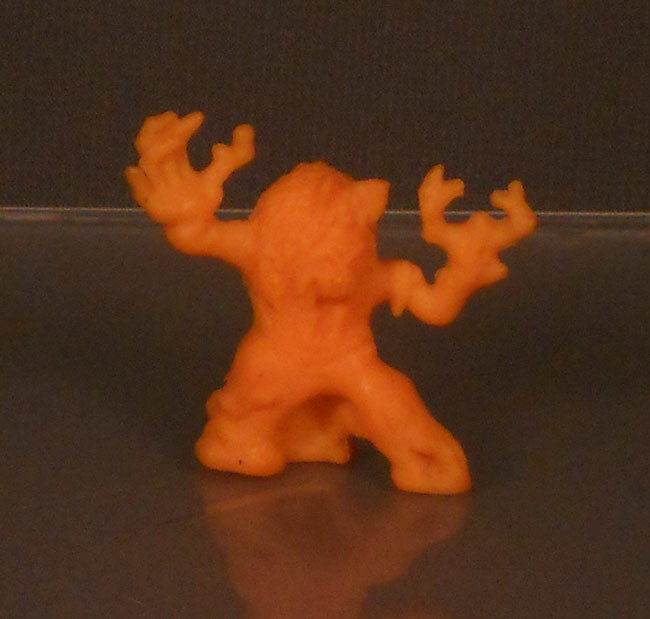 One of the more popular little rubber figure lines from my childhood was Monster in my Pocket. They came out in 1990, and found success all over the world. 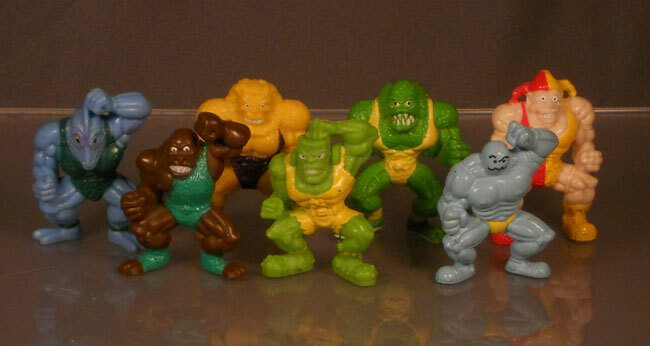 The line consisted of a bunch of small, solid colored rubber monsters based on popular monsters from international folklore and popular culture. Everything from Frankenstein’s Monster to Baba Yaga are represented in the line. If you don’t remember Monster in my Pocket yourself or you want to know more, here is a quick pictorial crash course on the line. A Sampling of Series 1 Monster in my Pockets. Now that you have met some of the Monster in my Pocket gang, I can get to the main focus of this article. Clearly I have spent a little bit of time collecting Monster in my Pocket. The photos above represent a small fraction of my collection. Monster in my Pocket were made by Matchbox and were sold in retail stores everywhere in the country. They were popular and cheap to produce, so they naturally found their way into promotional tie-ins with restaurants and food products. 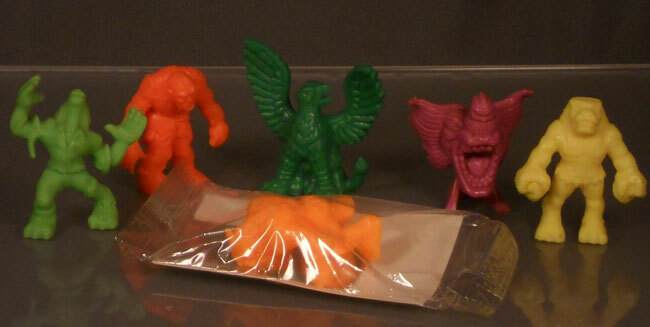 Most of the Monster in my Pocket figures that were produced for product tie-ins were Series 1 figures cast in different colors than the red, green, yellow, and purple seen above. Many were produced in Series 2 neon colors, with occasional oddities in slightly different shades of bright colors, or a dark forest green color. Monsters in strange colors. 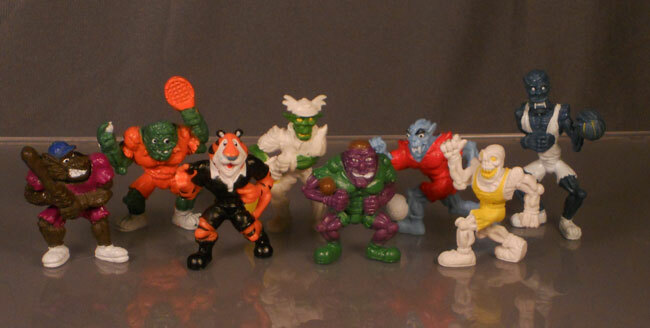 These Monster in my Pockets were packaged with food tie-ins and other Monster in My Pocket products other than the main figure lines. Monster in my Pocket had an American cereal tie in with Nabisco Frosted Wheat Squares. They also had a promotion with Bob’s Big Boy. The tie in that is really the point of this article is a promotion run with Spaghetti-O’s. Every kid loves Spaghetti-O’s, and what could be better than getting a free toy with your purchase? Of course they didn’t put a Monster in my Pocket in the actual can of Spaghetti-O’s. That would make a mess. You had to mail away to get them. Since kids are impatient, and Spaghetti-O’s needed to get you excited to have to wait to receive your toys, they had to find a big way to get kids attention. Behold the inflatable Spaghetti-O’s Monster that is the size of an actual child! This inflatable display is based on a Series 2 monster design, Dryad. I wouldn’t call this figure the obvious character choice that kids could relate to, but it kind of looks like it could be made out of spaghetti when you color it red-orange like this, so I am going to go along with Spaghetti-O’s decision making process on this one. 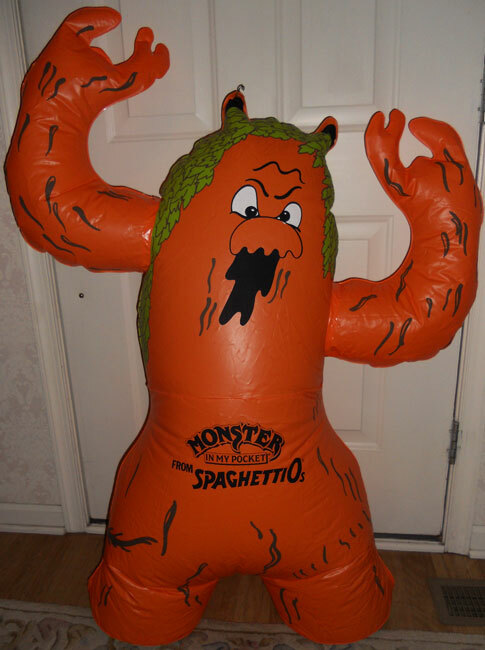 When this 4ft tall pile of inflatable awesomeness found its way onto eBay several years ago I made it my mission to make him mine. In a collection that could otherwise fit in a shoe box, he is certainly a stand out. I have always liked store displays, and when I can find a display based on something I specifically collect it becomes a must own for my collection. I only wish that my local super market had had one of these guys on display when I was a kid. I am pretty sure a Monster in my Pocket taller than I was would have made my day. It sure made my day when I found one as an adult. This entry was posted in 1990's, Action Figures, Amy, Comic Characters, Food, Foreign, Halloween, Humor, Kitchen, Monsters, Toys, Weird. Bookmark the permalink.